I finally took some photos of the main view of the farm – the one you see from the road. It’s too wide to take with one photo so I combined three photos into a panorama. The valley in the middle is Center Valley. The bluff on the left is Pine Point, with Big View Prairie on top. The bluff on the right is Sumac Bluff, with Sumac Prairie at the top. I’ve been working very hard on my two weeding projects – Wild Parsnip and Mullein. I usually do a few hours on each project each day. I’m getting to the end of both projects – not because the weeds are gone, but because the seeds are ripening and starting to fall off the plants. The point of weeding is to keep the plants from spreading their seeds, so pretty soon I’ll give it up for this year. One day I was cutting Mullein, and Mike was mowing nearby. The Barn Swallows love to follow the tractor – I’m sure it stirs up lots of bugs for them. 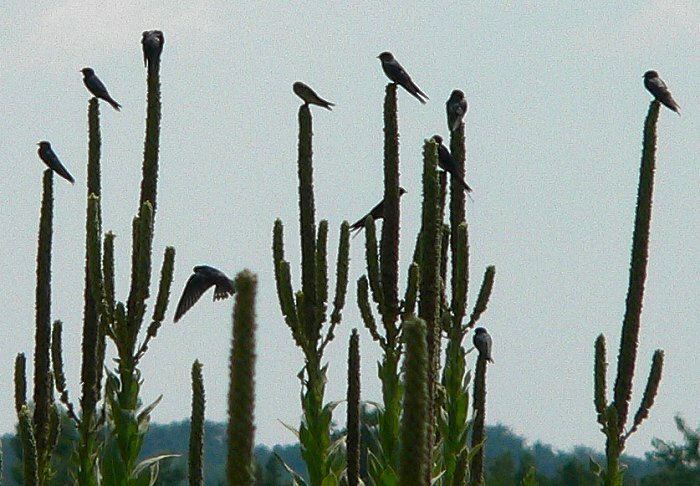 They were swirling around the tractor and skimming across the prairie where I was working, and they would stop to rest on the tops of the Mullein stalks. It made the Mullein look even more like Saguaros. I’m trying to remove the Wild Parsnip from the best parts of the wetland, and from the places where we’ve started trying to restore native wetland vegetation. Here’s one area that I planted last winter coming up with a first-year crop of Blue Vervain. 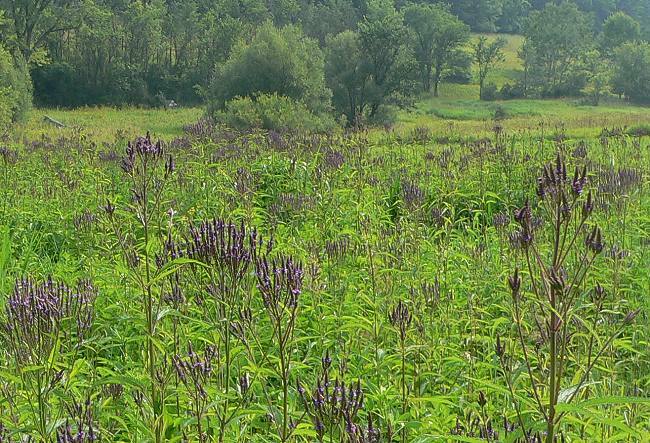 Vervain comes up quickly and blooms the first year, but then other species take over as the wetland matures. 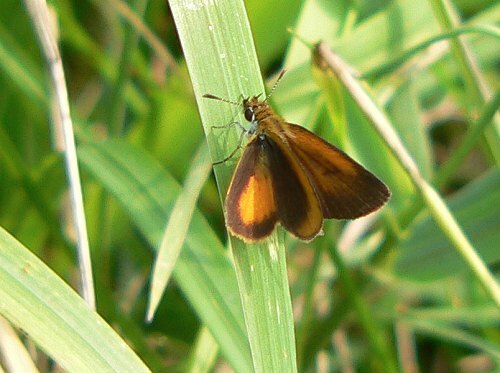 Here’s a Least Skipper – a very small butterfly – in the wetland. And this is a black Tiger Swallowtail. Some female Tiger Swallowtails are black instead of yellow. They’re much less common, so it’s fun to see one. 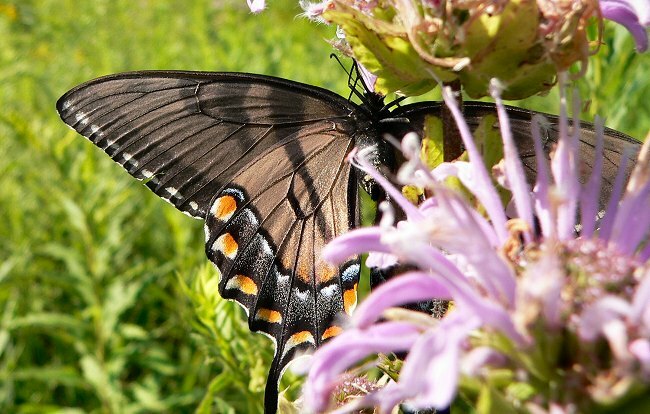 They’re larger than Black Swallowtails, and fly more slowly and gracefully. And you can see the dark tiger stripes on the wings. On the way back to the burn pile with my load of Parsnip I found a family of Wild Turkeys crossing the driveway. 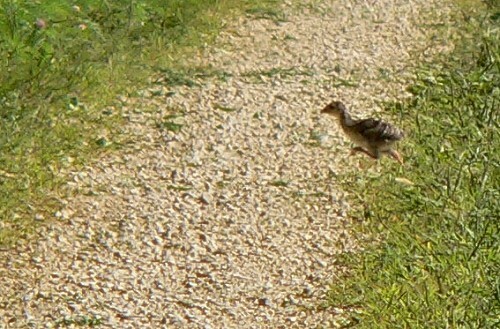 Mom was on one side, in the bushes, and the babies were taking turns scurrying across the road. Here’s a slightly blurry photo of one of them – it had popped out of the tall prairie plants, and was scooting across as fast as it could go. I went to visit two nearby wet areas this week – they’re called Tamarack seepage swamps. It’s fun to see the variety of wetland vegetation that exists in this county. Here’s the story with some photos. 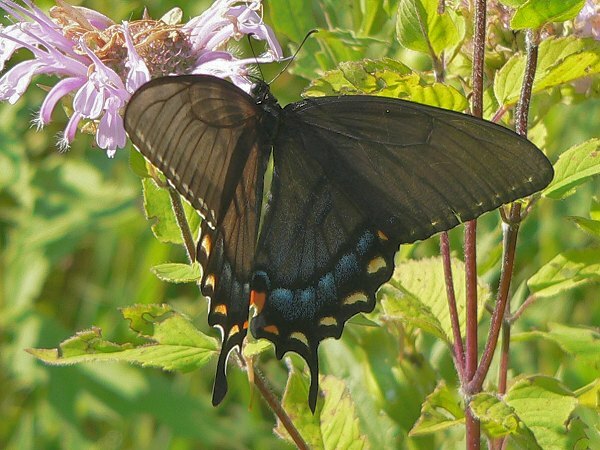 I saw a new species of butterfly this week – in Pepin County, right in front of the farm stand where we buy our corn. 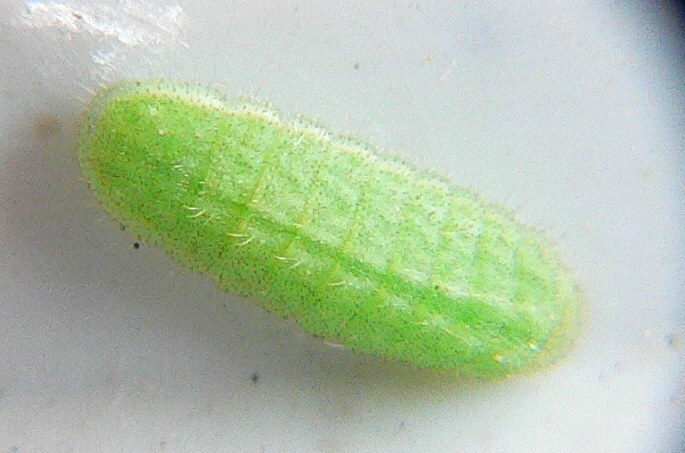 It was a Dainty Sulphur – tiny and bright yellow with a couple of black spots. Dainty Sulphurs don’t overwinter here; they come up from the south most years. 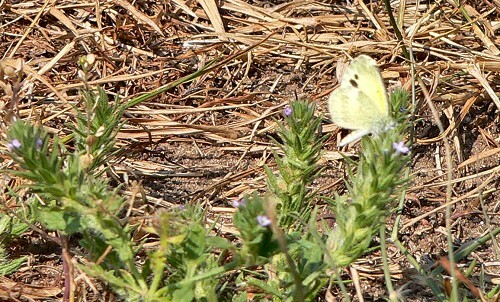 Today when we stopped to buy more corn there were 5 Dainty Sulphurs still in the same dusty patch of roadside. On one of my evening walks I saw a coyote playing – probably with some prey it had caught – in the mowed cornfield up on top of the hill. It hadn’t seen me, so I sat down in the grass to watch. It ran and jumped and played for a while, and then more coyotes started to drift out of the woods and from the other side of the hill. Eventually there were two larger ones, and four smaller ones. The one I had seen first was one of the smaller ones. One of the large ones heard something in the distance – it might have been other coyotes calling but the noise was so faint that I could barely hear it. The largest coyote headed back into the woods. It took a while for the other large one to collect all the kids, but eventually they all wandered back into the woods and disappeared. On another evening walk I watched the full moon come up over the hills across the road. It was completely full, round and bright orange. Last week we finally identified one of the birdcalls that has been puzzling us for a long time. For the last month or so we would hear it in the woods as we took our morning walk along the road, and sometimes I heard it in the woods above 3 Finger Valley. I finally figured out that it’s a Veery. I’ve been starting to do the plant and butterfly surveys that I’ve promised to do for the grant we got to help us clear some of our savannas. We’ll get help cutting trees and brush on Sumac Bluff, Pine Point/Big View, Indian Grass Point, and Hidden Oaks Point. I need to do surveys at the beginning and again at the end of the project. I did the plant survey for Indian Grass Point this week, and looked for butterflies at the same time. 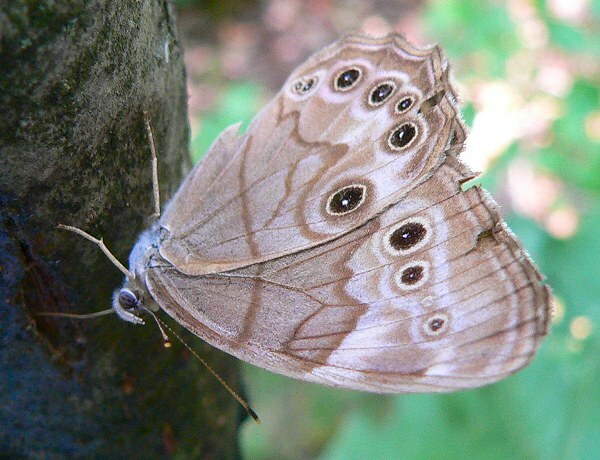 A Northern Pearly-eye was flying around in the woods, keeping an eye on me. It finally stopped on a tree next to me, and let me get the camera very close. Here are this week’s caterpillars from my cages. 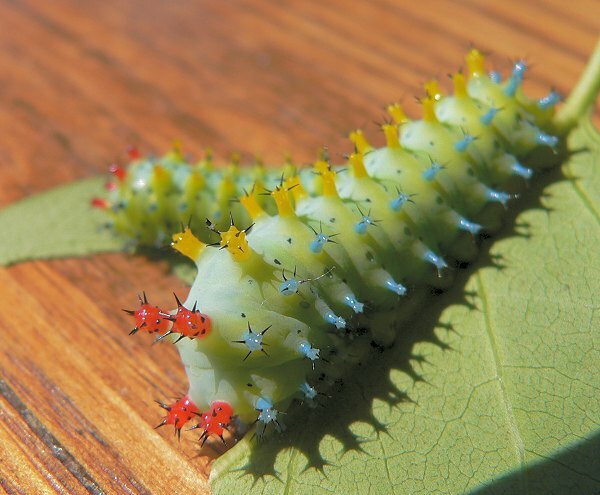 The Cecropias are in about their 4th instar – their final coloring, but not their full size. 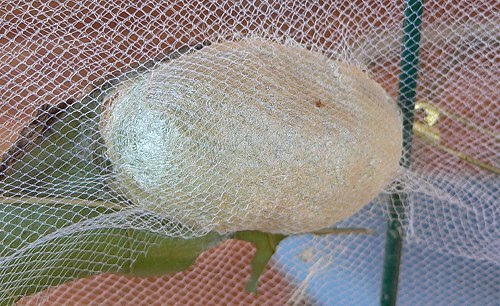 This is the cocoon of the caterpillar that I think is a Prominent or a Variable Oakleaf Caterpillar. It wrapped itself up in the net that I used to make the cage. I’ve pulled it off the cocoon now, so it can escape when it emerges. 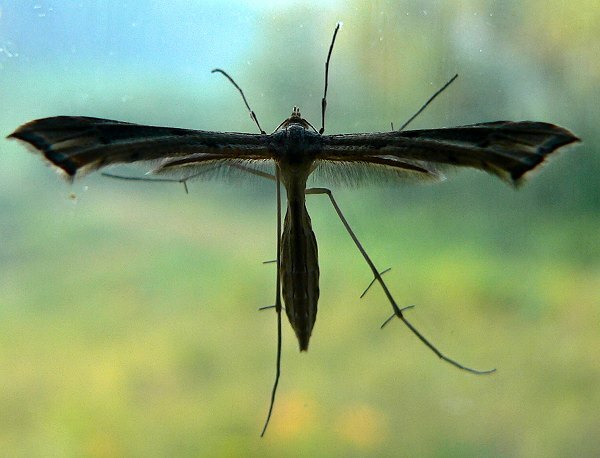 I’ve been finding Plume Moths in the house – on the walls and windows. They’re odd looking moths, and don’t do any damage inside. 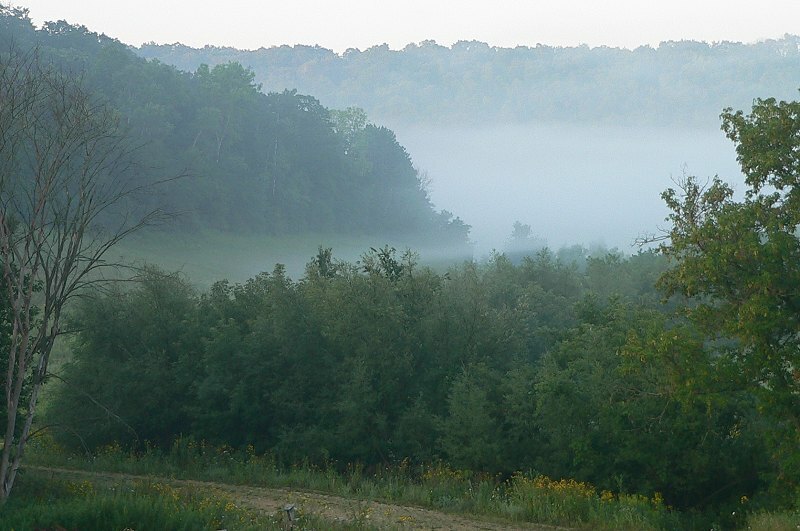 There’s often morning mist in the creek valley when I get up. 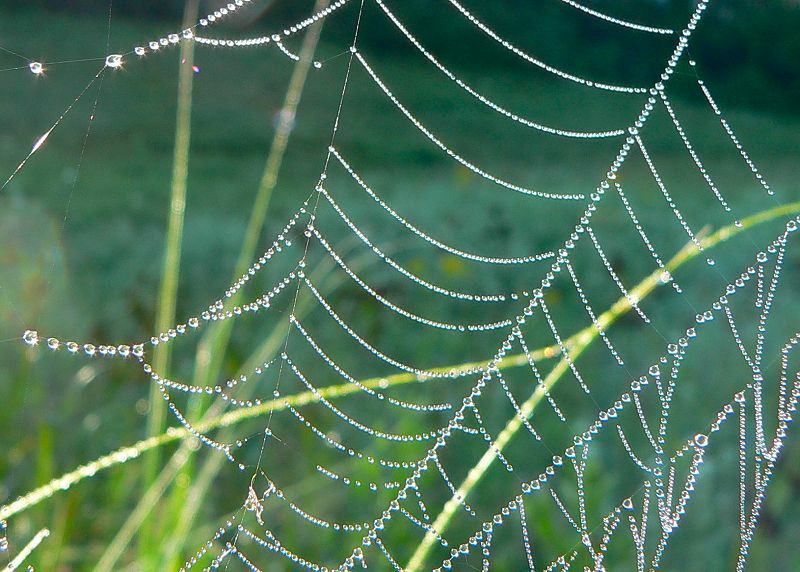 The mist usually disappears before I get out to start working, but the dew stays on the grass and on the spider webs.